Tessie McGoldrick pictured at her birthday celebrations with some of the many people who attended on the night. 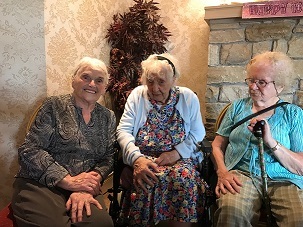 Belleek’s very own First Lady, Tessie “Teresa” McGoldrick, nee Dolan, had a very special 100th birthday party in the Jolly Farmers recently. Some members of her family and her friends joined this gentle and eloquent lady for her special day, and she even got a nice birthday card from Queen Elizabeth. Tessie was born on June 28, 1918, the year the “War to end all wars” finished, while in her native country Sinn Fein swept to victory in the General Election as this country began to take baby steps towards independence. She has lived the War of Independence, the Civil War, the Depression, the Second World War and the Troubles in that part of Ulster where Fermanagh’s furze fingers meet the brown hills of Donegal. 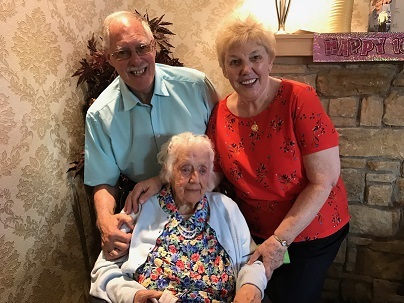 Tessie was born in Scotland and lived in Corlea on the Donegal border with Belleek before she married her late husband Hughie McGoldrick in 1937. She has great memories of going to ceilidhe and dances in Corlea Hall and of Cliff House, the Big House around Corlea owned by Major Moore, where some of her friends worked. And she also recalls some injured US airmen being brought to her uncle Thomas McCann’s home in Corlea in 1946. Tessie has indeed seen many changes. “It is great to have lived so long and everyone has been very kind. “I am not sure about what the real secret to a long life is but hard work never killed anyone. “People are very kind and it is great to see them all here”, she said.